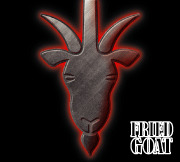 Fried Goat is Southern Rock with a conscious. Or a conscience. Take your pick, they're not spellers. Unashamed. Not good with women. A dirty-floor bar band with a pop twist that comes and goes before you’re sure it’s OK to admit you heard it. Then it you hear it again. It wears a nicked-up heart on its sleeve. It is rock n roll without bravado. This second studio album has something familiar for long-time fans all throughout it. Try 'Henry's Revenge.' Listen to ‘Guilt Trip” for notes of Bon Appétit. But altogether this is a sweeter sound. A little more love-struck. Possibly wiser. There's a Christmas song. There's an almost Ska version of The Charlie Daniels Band classic, ‘Long Haired Country Boy’. Nothing in Bulgarian this time out, but it’s still Fried Goat. The crunch is guaranteed.